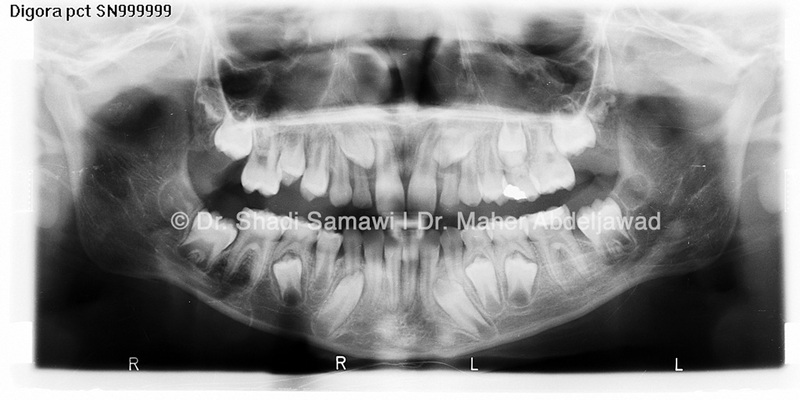 I thought today’s post should be about something more clinically-oriented, so I’ve decided to share with you a short summary of a multidisciplinary-treated case which I had treated several years ago in collaboration with my colleague and brilliant Restorative Specialist Dr. Maher Abdeljawad*. 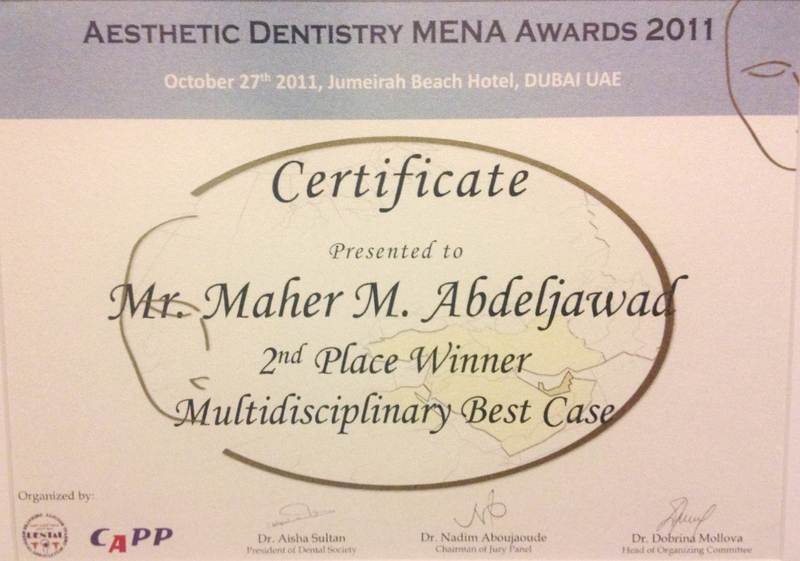 This case was awarded the 2nd place award in the Multidisciplinary Best Case Category at the peer-judged MENA (Middle East & North Africa) Aesthetic Dentistry Awards in 2011. We are sharing it here because it clearly demonstrates the importance of a multidisciplinary approach in communication, planning and execution in dentistry, and we wanted to emphasize that point in this post. 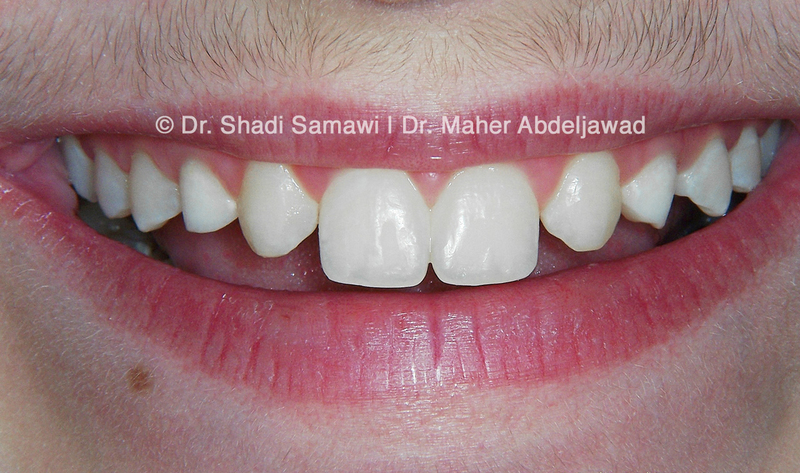 A 10 year-old healthy young male** in the mixed dentition stage presented to the Orthodontic Clinic after being referred by the Restorative Specialist for orthodontic assessment, as congenitally missing upper permanent lateral incisors were suspected. Clinical examination exhibited a Class I malocclusion on a Class I skeletal base with an average overjet, overbite and Class I molar relationship bilaterally. Radiographic assessment with an OPG confirmed the congenital absence of both upper lateral incisors, and showed both upper canines’ eruption path mesial to their predecessors in place of the missing lateral incisors and the left canine appeared to have started overlapping the root of the left central incisors. The lower permanent canines also showed signs of an excessive mesially-angulated eruption path. It was agreed to start by intercepting the developing malocclusion with minimal intervention and maintain/create spaces for upper and lower permanent canines respectively, allowing upper canines to replace missing lateral incisors. The decision was made to retain the still-firm deciduous canines (with non-resorbed roots) in place until comprehensive orthodontic treatment was in order. By then, a re-assessment of the situation would be made. preserve space and alveolar bone in the area for future implants, should the deciduous canines shed spontaneously in the future. Keeping the non-mobile, healthy upper deciduous canines serving as natural replacements for as long as possible is more conservative and usually preferable. This way, we would succeed in deferring any kind of surgical procedures and more invasive restorative procedures until adulthood, when all growth had ceased. Allow the lower permanent canines more space to erupt in their normal position, intercepting their apparent mesial deflection as quickly as possible. 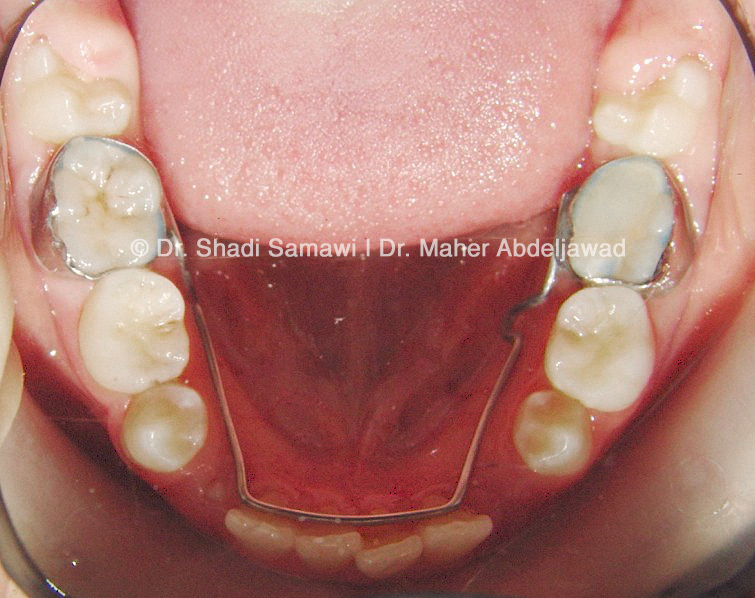 • The patient was fitted with a lower lingual arch space maintainer and upper Nance Button appliance to help minimize unwanted mesial movement of upper and lower molars. • The extraction of retained upper deciduous lateral incisors & Lower deciduous canines, and observation at 3 to 4-monthly regular intervals (patient resided in KSA) until permanent canines had sufficiently erupted in both arches. Level, align and coordinate both arches. Refer back to the Restorative Specialist post-treatment for re-shaping and aesthetic restorations of deciduous and permanent canines. Total orthodontic treatment time was approximately 24 months. 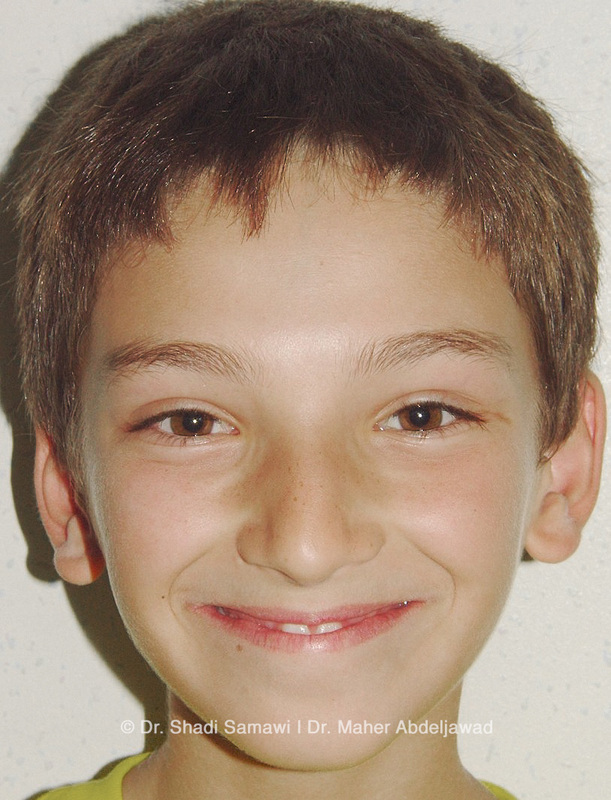 Pre-Tx – Face Frontal Smiling. 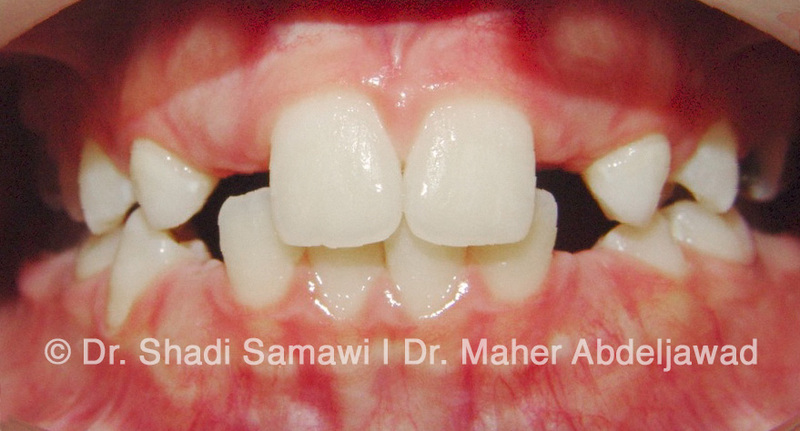 The patient was shy and reluctant to show his front teeth due to the gaps. 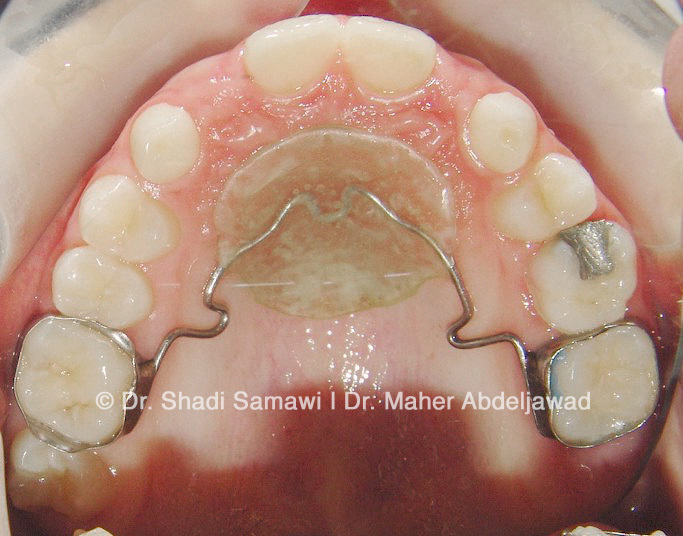 Nance Button Space maintainer as an extra precaution in order to minimize mesial drifting of upper posterior teeth. 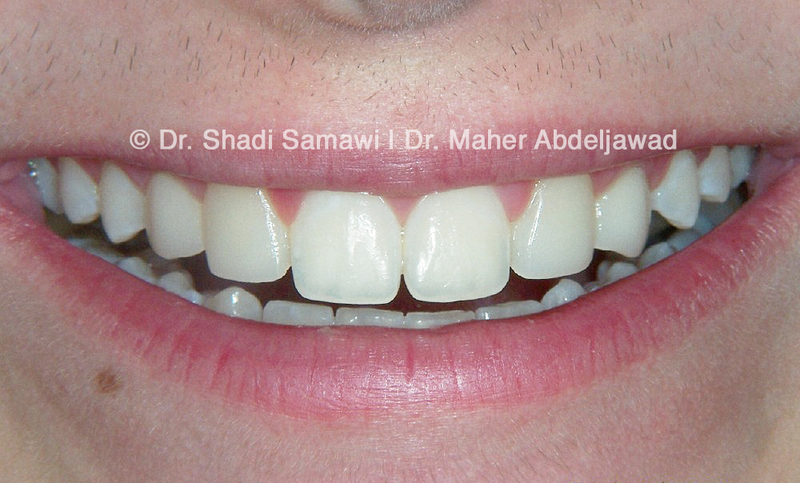 Lower Lingual Arch to minimize mesial drifting of lower posterior teeth. 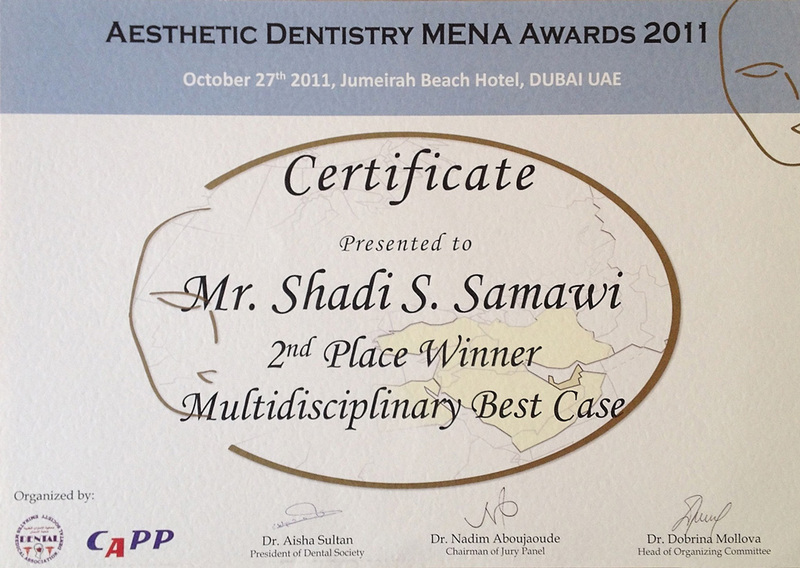 After the completion of the orthodontic treatment, the patient was referred back to the Restorative Specialist (colleague Dr. Maher Abdeljawad) for aesthetic dental treatment in order to camouflage the upper permanent canines and retained deciduous canines (which were still firm and non-mobile with minimal root resorption) into permanent lateral incisors and canines respectively. A wax-up of the proposed aesthetic dental treatment was fabricated and discussed with the patient and parent. Both were happy with the wax-up of the proposed aesthetic dental treatment and the decision was taken to proceed with the actual aesthetic treatment. Since the patient was only 13 years old and had excellent oral hygiene, it was decided to make direct composite veneers and not porcelain veneers as they are less invasive and can achieve a very good result. A VITA classical shade guide was used to determine the patient’s shade. It was decided that the patient’s shade is A2. A layering 2-shade technique was to be done using FiltekTM Supreme XT from 3M ESPE. Therefore, according to the 3M ESPE shade wheel, the 2 shades needed to produce A2 were A3B (Body composite) and A2E (Enamel composite). The etchant used was Ultra-EtchTM (35% phosphoric acid) from Ultradent, while the bonding used was AdperTM Single bond 2 from 3M ESPE. A tapered with rounded end diamond was used to remove 0.5 mm from the labial surfaces of the permanent canines. A Lesser amount of tooth structure was removed from the labial surfaces of the retained deciduous canines. This reduction was done to provide space for the composite veneers in order not to bulge out, and to increase their bonding strength. Using a lingual putty template fabricated using the wax-up model, a layering 2-shade technique was done with the FiltekTM Supreme XT A3B and A2E shades in which the 2 permanent canines were transformed into permanent laterals, and the 2 retained deciduous canines were transformed into permanent canines. The new direct veneers were made to be symmetrical and in harmony with rest of the dentition in order to produce an aesthetically pleasing result. Finally, finishing and polishing was done with composite finishing burs followed by Sof-Lex TM XT finishing discs. Final orthodontic tooth positioning and restorative results were planned and executed to produce an esthetic smile line and tooth proportions that followed the “Golden Proportion” as closely as possible. The patient has been under annual follow-up for several years now and the deciduous canines are still serving their role, with only minimal mobility and minor resorption in their root apices in the most recent follow-up OPG, which is expected by this time. Should one or both canines spontaneously shed or become excessively mobile at any time now, space and alveolar bone are preserved for what should be a relatively straightforward placement of implants and prosthetic crowns. One question we received upon presenting this case a few years ago to the Jordanian Society of Conservative Dentistry (JSCD), was regarding the decision to preserve the deciduous canines and why we didn’t choose to extract them both, open the lateral incisor spaces and place dental implants. As we clearly stated above as our rationale for treatment, that suggested approach would have resulted in the need for immediate prosthetic replacement included in the retainer for years post-treatment (the patient was only 13 years old when finished), as well as risked alveolar bone and space loss over time, by the time he was indicated to have implants, which was not until all growth had virtually ceased, particularly vertical growth. Another minor consideration we personally discussed was the gingival margin contours of the camouflaged deciduous canines, which could have been improved to further enhance the result, but since there was minimal gingival show upon smiling and a good lip line upon smile, we ultimately opted for being conservative to avoid compromising the health of gingival tissues around the deciduous canines which may reduce their longevity. So overall, we believe we chose the most conservative, long-term approach that provided the best natural, esthetic and functional occlusion given the situation, and it has certainly proved to be the better long-term decision, in our opinion and the patient’s as well. 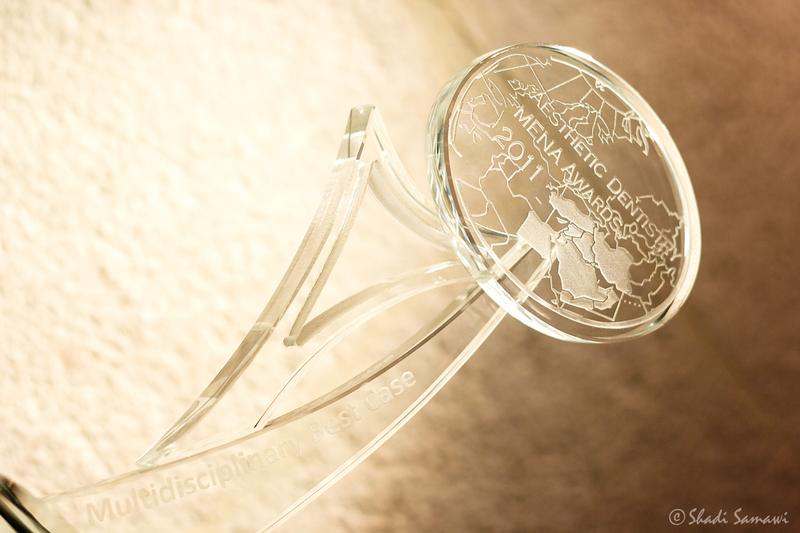 Although, from a technical orthodontic point of view, this was not such a difficult case to treat, we believe the timely referral and early Ortho-Restorative communication and planning every step of the way, along with the final restorative result are what make this particular case really shine. This case is a clear example of how clear, constant and effective communication between different specialties – and between doctor and patient – can produce excellent long-term results and should enforce the idea that team work is an essential and integral part of dentistry in this day and age. We often see simpler cases fail due to lack of proper communication between treating dentists or even worse, between patient and dentist, that we thought it merits to reinforce that notion again in this post. photographs for case presentation in multiple media. Thank you for your comment. As explained in the post, and Considering he would need at least 5 years before being able to have proper implants done, our choice was to keep things as simple as possible. A micro implant can never maintain proper bone thickness and levels as a natural functioning tooth. By the time his composite restorations would require modification, it would be time to do proper implants anyway. : Simple management concepts with no unnecessary over treatments.